Story: Mark Grayson grew up in a relatively normal family environment, apart from his father being the super-hero Omni-Man. He was told about his heritage as a kid and knew that one day when he hit puberty, he would start to get powers like his father . One day while working Mark was taking out the garbage, his powers started manifesting themselves and he accidentally threw the garbage high up in the air instead of just up in the dumpster. In the following two weeks, Mark tried out his new powers and took on some old clothes so nobody would recognize him while he was trying to learn how to be a super-hero. One day when Mark was out using his powers to fight crime, his father found him and took him to a tailor he knew who specialized in super-hero costumes. Here he got a costume, a few days later, after he had found a name for him-self . 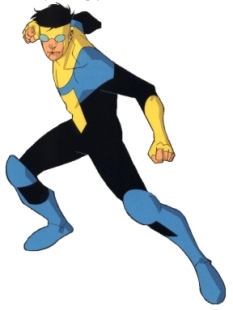 Skills & abilities: Super-strength, invulnerability, enhanced speed and flight.